In high school, students are required to attend school—it’s the law. However, college is a choice. Students can choose which college to attend, what to major in while in college, what professors to take, and what career path they want to follow after college. A key point for you, as a student, to understand is that for whatever the reason, you have made a choice to be in college. Ultimately, you have a choice to manage that decision responsibly, which in part requires that right attitude toward college if you are to be successful in the end. Students typically begin college with an optimistic view of their ability to succeed beyond some of the normal apprehension regarding what college will be like. After a few weeks or months, students might begin to have some doubts about their ability to succeed, and that is completely natural. However, it is the attitude that students adopt at this point that can “make” or “break” their academic career. 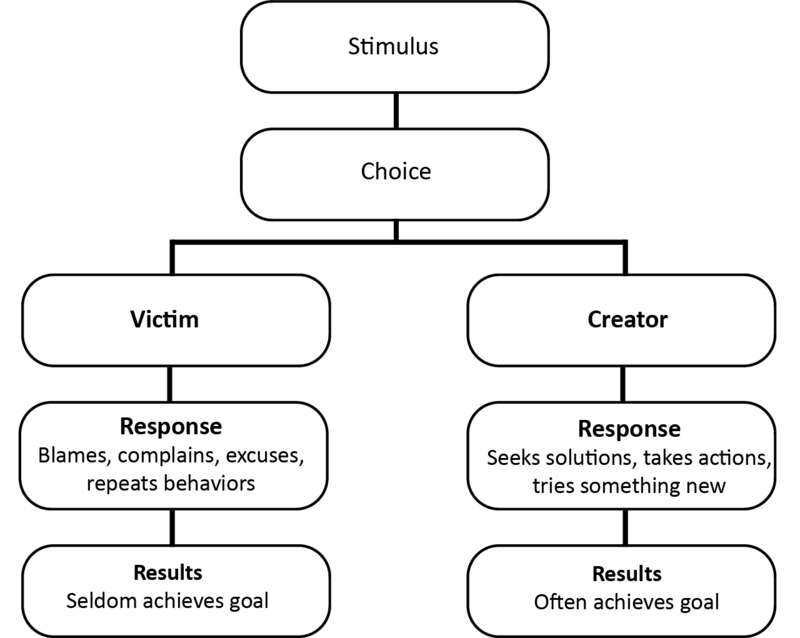 According to Skip Downing (2008), students’ general attitude toward a given situation tends to fall into one of two general categories: a Victim or a Creator (see Table 4-1). Victims tend to believe that they have little control over the world and what happened to them in a given situation. Often, victims continue to repeat behaviors that have not proven to be effective in the past, in part because it is the easier thing to do. Typically, they understand what they should have done in a situation but tend to respond, “Yes … but…,” followed by an explanation of who is to blame or an excuse. On the other hand, creators accept personal responsibility for themselves and their thoughts, beliefs, and actions. When their thinking and behavior has been proven to be ineffective, they seek out help and new information and try something new (see Figure 4-1). Overall, in a study of nearly 1,000 new undergraduate students, researchers found that those students who adopted an attitude of a creator were more successful in meeting their goals in continuing in college compared to students who adopted an attitude of a victim (Vallerand & Bissonnette, 1992). It is important to note that students are not born with the mindset of victim or creator in their approach to life. Students can choose to adopt the mindset that they want to adopt. For instance, students can choose to spend their precious time and energy blaming others and complaining about all of the obstacles (behaving as a victim) which does nothing to change the outcome, or they can choose to seek out new information and assistance from others that will help improve the outcome (behaving as a creator). If you find that you (or a fellow student) is behaving more like a victim in a given circumstance, think about how you are reacting and choose to adopt a creator mindset and action plan.